Members who have established a new Membership or are new to Online Banking since December 1, 2018, including those from LICFCU. In an effort to support the charitable work of local organizations that serve the areas of Suffolk Federal branch locations, the credit union has identified nonprofit organizations to provide financial support to. In West Babylon, Branch Manager Mary Warren-Mancini presents a $1,000 contribution to Jacie’s Kids. 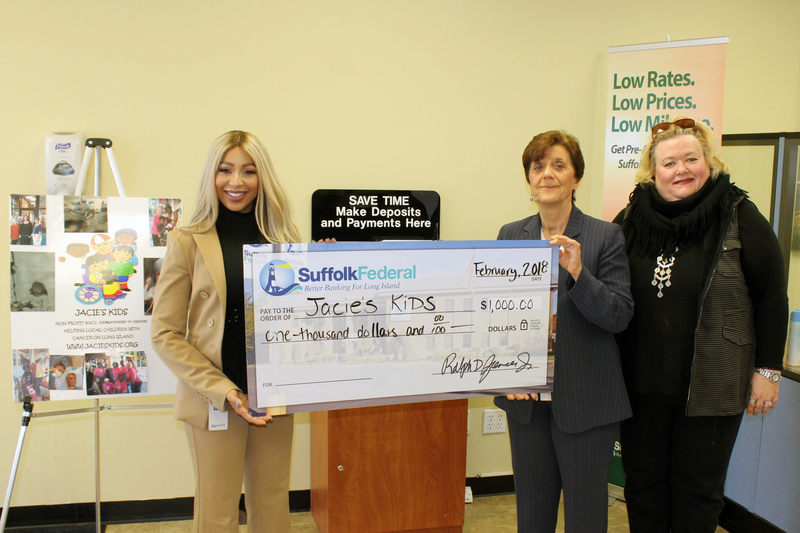 Pictured left to right: Mary Warren-Manicini, Suffolk Federal West Babylon Branch Manager; Beatrice Hass, President, Jacie’s Kids and Ann Carolan, Vice President, Jacie’s Kids. Attention Members: In observance of Good Friday, All Suffolk Federal Branches will be closing at 3pm on Friday, April 19.